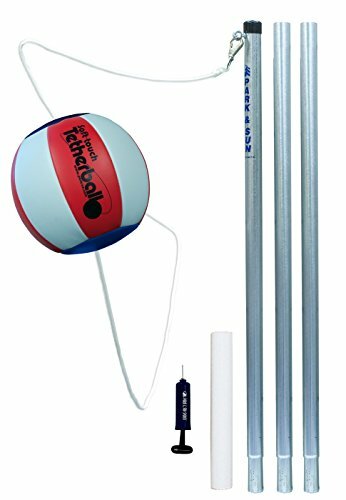 Bring the fun of tetherball to your backyard with the addition of the Park and Sun Classic Tetherball Set - Americana. The sturdy 3-piece pole is constructed from galvanized steel and is 1.5inches thick in diameter. The tetherball is crafted from premium-quality “Soft-Touch” material in red, white, and blue colors. An internal cord connector keeps the ball intact, and 12-inch ground sleeve provides easy removal. Sturdy 3-piece galvanized steel post. Post is 1.5-in. thick in diam.. Premium-quality, ''Soft-Touch'' red, white, and blue tetherball. Ball pump included. Internal cord connector. 12-in. ground sleeve offers easy removal. Post is 1.5-in. thick in diam. If you have any questions about this product by Park & Sun Sports, contact us by completing and submitting the form below. If you are looking for a specif part number, please include it with your message.